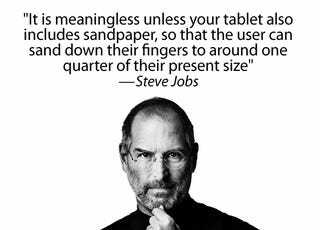 In a withering rant on emerging rival tablets like Samsung's Galaxy Tab, Steve Jobs basically confirmed there will never be a seven-inch iPad. It's too small. He explains that the screen size of the seven-inch tablets coming out is really just around half of a ten-inch tablet, which isn't good enough for them. "This size isn't sufficient to create great tablet apps, in our opinion. While one could increase the resolution of the display to make up for some of the difference, it is meaningless unless your tablet also includes sandpaper, so that the user can sand down their fingers to around one quarter of their present size." That explains why the mysterious seven-inch iPad never made it past the prototype stage. "We don't think you can make a great tablet with a seven-inch screen" because it can't "express the software" very well. Steve says that Apple thinks a "10-inch screen is [the] minimum." He also seems to poo-poo the idea of having multiple tablet sizes, again out of concern for the software: "Software developers aren't gonna deal real well with all these different sized products, when they have to redo their software every time the screen size changes..."
That 7-Inch iPad Rumor Just Won&apos;t Die, Will It? That said, Steve's still pretty up on tablets themselves: "We've got a tiger by the tail here. This is a new model of computing."